New last year, this fabulous cool coastal apartment benefited from a makeover and facelift to enhance this already superb holiday home. All the beds have new mattresses, skandi inspired linen headboards and coordinating bedding. The lounge has new soft furnishings and had new colours introduced to the palette along with white washed coffee and side tables. There is a stylish and bright new dining table and chairs to complete the updated look. 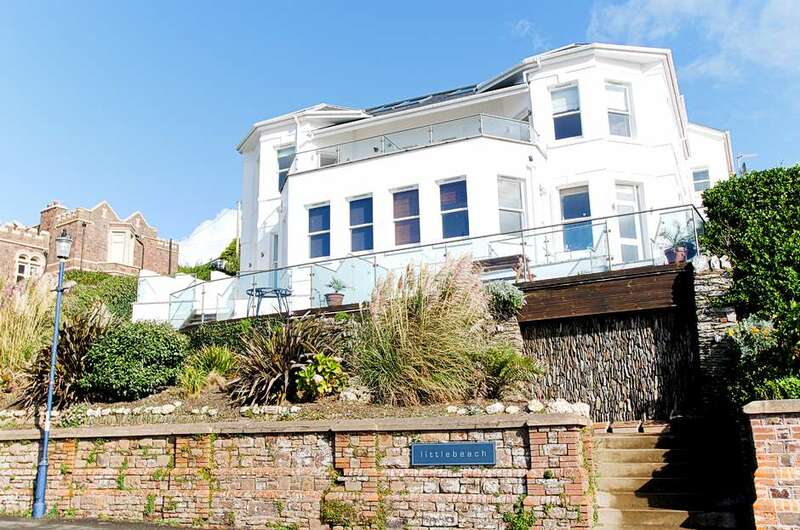 6 Little Beach is a beautiful stylish contemporary apartment with stunning sea views from the main living area, sleeps 4/6 in 2 bedrooms and has parking, Wi-Fi and is situated in one of the most sought after locations in Woolacombe, on The Esplanade between main beach and Barricanne Beach. Little Beach is a prestigious development of high quality contemporary waterside apartments situated in arguably the finest locations on the rugged North Devon Coast. The building is literally across the road from the award winning golden sand Blue Flag surfing beaches and enjoys stunning uninterrupted views across Woolacombe Bay taking in the countryside, golden sand beaches, Baggy & Hartland Points, Lundy Island, Morte Point and the Atlantic Ocean. There are 8 apartments within the development, all of which have been individually designed and have a high specification with good quality fixtures and fittings including a well fitted kitchen, luxury tiled bathrooms, light oak wood flooring, gas central heating system and double glazed windows. There is an allocated parking space at the rear and additional visitor spaces for the occasional day visitor on a first come first served basis. Within the communal area is a surf board store cupboard. The apartment is located on the top floor and has direct level access from the car park at the rear. There is an entrance hallway with oak floor and a security intercom to both the front and rear door ways. The heart of the apartment is the superb and quirky, characterful 22ft x 17ft living room which has a lovely, newly installed very large roof window with a window seat underneath enjoying excellent views over the bay and golden sand award winning beaches. There are three further large 'velux' window which open right up and again enjoy views across the entire bay and golden sand beaches, Baggy, Hartland and Morte Points and Lundy Island. One of the 2 sofas is a sofa bed for an additional couple if needed. For entertainment there is a TV, DVD, Xbox and a few games, box of children’s toys and Wi-Fi. There is a well fitted contemporary kitchen with a range of white, high gloss base and wall units complimented by composite worktops and built in appliances which include a gas hob with extractor hood over, electric oven, fridge/freezer, dishwasher and washer/dryer. The oak flooring continues through the entire room which also has a useful storage cupboard. There are two double sized bedrooms. Bedroom 1 has its own en-suite shower room/wc with a modern white suite including a walk in shower cubicle with raindrop head shower, low level WC and a hand basin with mirror over. The second bedroom has twin beds sleeping 2 with clothes storage. The family bathroom has tiled walls and floor and a modern white suite comprising a bath with raindrop head shower, low level WC and a hand basin with mirror over. Woolacombe is popular with visitors from all around the country, primarily because of its award winning blue flag golden sand beaches. In addition, the village is also surrounded by National Trust land which has miles and miles of walking along some rugged footpaths enjoying the magnificent coastal scenery. The village amenities include a variety of small independent shops, bars and restaurants and various other leisure facilities which include a health centre within a hotel and church. The nearest larger town is Ilfracombe being approximately 5 miles away and Barnstaple which is North Devon's main trading centre is approximately 14 miles away and has many of the big name shops, a rail link and direct access onto the A361 North Devon link road which joins the M5 at junction 27. This apartment will take a dog at a charge of £20 per dog per holiday. A £100 security deposit is held and released after the holiday. 6 Little Beach is a good value 2 bedroom seafront apartment sleeping 4/6 with modern facilities and great views. A great choice all year round.